Trivia Question: How long does is take for Royal icing to dry? Last week we hosted our first, of hopefully many, cookie decorating classes! Our guests got to learn from the award-winning Sassy Sweets bakery from Searcy, Arkansas. What’s a cookie decorating class like? Well let me tell you! It’s so much fun! It’s also not like any of our other sessions. Our cookie decorating classes are definitely more instruction based and learning the basics of cookie and cake decorating. You will learn how to line a cookie with frosting and fill the tops with royal icing. 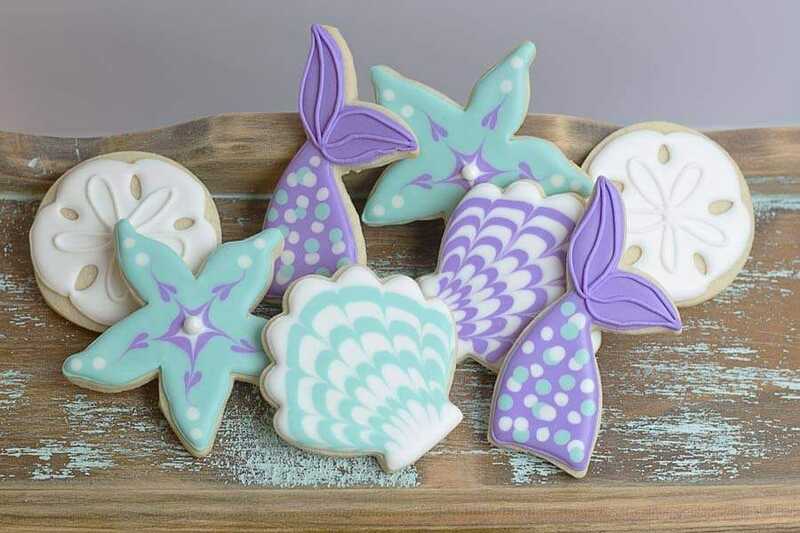 You will learn the basics of adding multiple colors of royal icing to the tops of cookies, how to add colors on top of each other and other fun tips and tricks. Our mermaid class taught our guests how to create hearts, curves on the shells, and to add outlines on top of wet Royal icing. To answer the trivia question above, it takes a full 24 hours for it to cure. My son’s were dry this morning to take his to school for a snack! Stay tuned for our next class, it should be around Mother’s Day!